In recent months, I’ve continued to carve new rubber stamp designs. I find that Sundays—when there are a fair number of visitors to my studio—are a good day to work on these. They give me something to plug away at during lulls, but don’t require my “getting in the zone,” which I like to do when I’m doing digital paintings. In other words, the carvings don’t suffer from being interrupted in process. 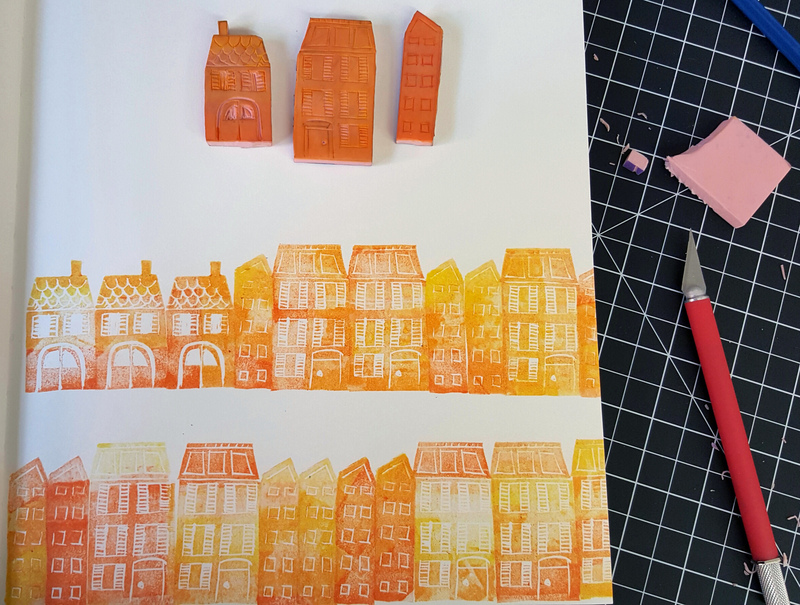 These little Amsterdam style houses have become a favorite subject of mine for carving. I like finding different ways to string the stamped images together. I usually draw my lines on the rubber in advance with a pencil. Then I can use my Sunday hours to carve away. As you can see, the lines are loose and imperfect. I want these to have a folky look, so I don’t try to be too precise with my lines. I have been using ink pads with graduated hues to create the variations in tone. There are six tones of any given color in each one, each in a strip moving from lightest to most saturated. I move them around as I press them on the rubber stamps, to make some areas darker and some lighter. I also overlap ink tones in some areas to get that yellow/orange blending that you see above. I also carved a piece of clear linoleum recently to make a linocut design. I’m still not sure how I feel about the clear linoleum. The label says it “cuts like butter.” It does not. Not unless we’re talking about frozen butter with concrete in it. I was occasionally worried I’d cut myself because the blade kept slipping. I found I had the most success using a fine point cutter. Anything larger than that was hard to get under the surface of the linoleum, and even when it did it wouldn’t stay there. So even when I wanted to do more than a thicker line, I found it easier to just keep carving thin lines very close together. 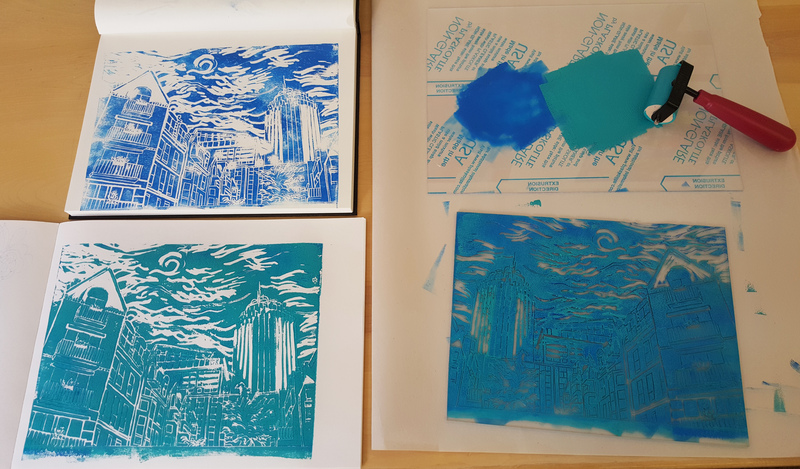 When I first decided to try the clear linoleum, I was attracted to the idea that I wouldn’t need to transfer the image to the linoleum. I printed one of my digital paintings in black and white, then taped it to the underside of the linoleum. There are two problems with this method. One is that the distance between the cutting surface and the image beneath the linoleum refracts the image. It’s sort of like looking at your hand while it’s under water. It’s impossible to cut directly on your lines because they shift depending on which angle you view them from. I don’t recommend this for any kind of precision line image. The second issue is that your printed image will be a reverse image of your original. 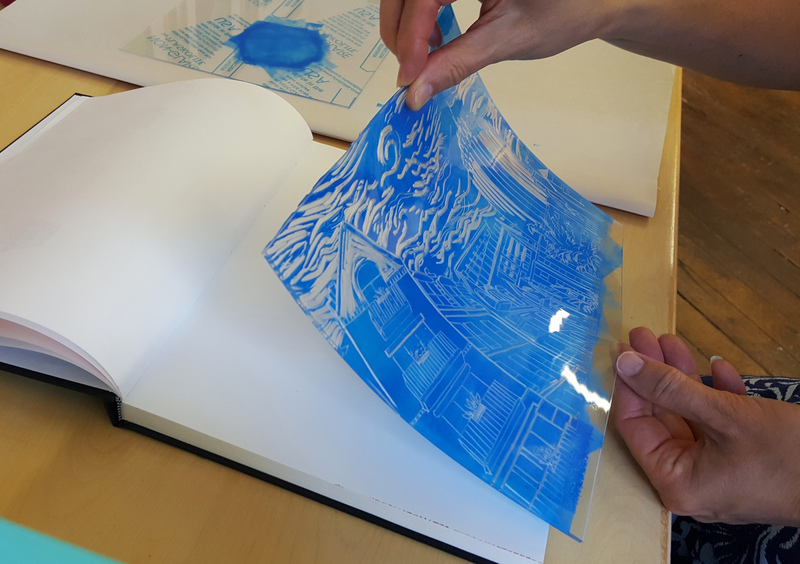 If you were transferring the image, you could put it in reverse on the linoleum to begin with, and then it would print correctly. But that step gets missed if you are just attaching an image to the underside. This might not matter, depending on what your design is. If you were carving a city scene like the one I made above, however, it wouldn’t accurately represent the placement of buildings in relation to one another. The image above shows two examples (on the left) of the same linocut printed. The top cobalt-colored one is missing a lot of ink. A few visitors popped in just as I had spread the ink on my plate, and in the five minutes we spent chatting, the ink dried substantially. That’s why you see big white gaps in some places. In the lower image I used a teal ink, and spread it on thickly. It turned out to be too gloppy. 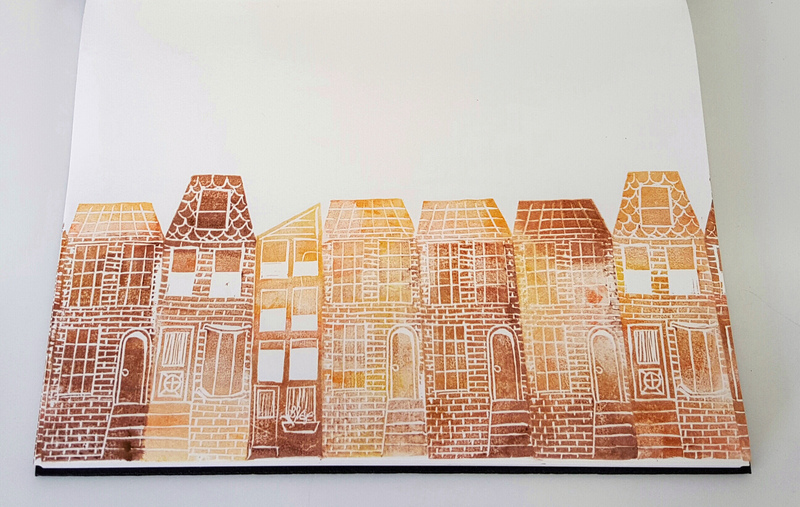 Much of the ink was pressed into the carved lines, and it creates a scene with less definition. Either way, these initial inkings are a good way to take a closer look at my carving. I can see from the printed image which areas still need more carving. I’m glad I tried it with the clear stuff. I might even try it again, but next time I would use a more abstract, forgiving design. Next PostFabric Designs: Orange You Excited?